Northern Ireland ended 30 years of waiting to rejoin football's elite after qualifying for Euro 2016 with victory over Greece at a Windsor Park stadium awash with emotion. Manager Michael O'Neill and his unsung squad have battled against the odds to reach their first major tournament since the 1986 World Cup in Mexico - and their first European Championship finals. It is a tremendous story of determination and team spirit - and France will surely be richer for their presence next summer. What have Northern Ireland achieved? This was arguably Windsor Park's most important one-off qualifier since November 1981 when Gerry Armstrong's winner against Israel sent manager Billy Bingham's side to Spain for the next summer's World Cup. The nerveless victory against Greece encapsulated a wonderful campaign, an unlikely success story, and by reaching Euro 2016 O'Neill's men have equalled - some would even say surpassed - the achievement of reaching those World Cup finals in the 1980s. O'Neill's players can take pride of place in Northern Ireland folklore and now start making headlines alongside fellow countryman Rory McIlroy, the golfing superstar who has carried the country's sporting flag so brilliantly in recent years. McIlroy was in the crowd at Windsor Park lending his support, along with IBF super-bantamweight boxer Carl Frampton, watching new Northern Ireland sporting heroes emerge. Belfast was alive with anticipation from early on Thursday morning, social media flooded by Northern Ireland fans expressing their hopes and dreams. In a country of just 1.8 million people, with players pulled in from the game's outposts, O'Neill has led his men from the very depths of despair to the heights of ecstasy that greeted the final whistle after the 3-1 win over Greece had sealed their place in France. As the players posed for selfies, supporters stayed in their seats long after the final whistle, and the country started a party that might last until next summer, the scale of what they have done bears close examination. Just seven months into O'Neill's reign, they hit their lowest ebb as they were 129th in the Fifa rankings - they now stand proudly at 35th. England expect qualification as they call on players from the Premier League's superpowers. Northern Ireland have pulled this off on the international equivalent of a shoestring budget. And to put the achievement into a recent historical context, it was only two years ago that they lost successive games 3-2 to Luxembourg - only that country's fourth international win - and 2-0 in Azerbaijan. From threatening to preside over one of Northern Ireland's most embarrassing footballing eras, O'Neill has transformed it into glory that will now be showcased in France. And the way in which he has manoeuvred a low-key squad means he can rightly take his place alongside Bingham, manager at the 1982 and 1986 World Cups, and Peter Doherty, who was in charge for the 1958 World Cup in Sweden. What may make this qualification one of Northern Ireland's greatest sporting feats is that while those squads of the 1980s contained some of the country's greats, so many players now have forged a career in the lower leagues. In those World Cups, Bingham's sides were burnished by the likes of legendary goalkeeper Pat Jennings and Manchester United pair Norman Whiteside and Sammy McIlroy. He also had players experienced at the highest level, such as Nottingham Forest European Cup winner Martin O'Neill and striker Gerry Armstrong, scorer of that famous winner in the 1-0 victory over Spain on their own turf in the summer of 1982. Those players were feted as sporting icons of the time alongside world featherweight boxing champion Barry McGuigan, "The Clones Cyclone". Now O'Neill and his players have the opportunity to write their names alongside those greats in Northern Ireland's sporting history. England can call on the cream of the Premier League, Wales can pull in a superstar from La Liga in Real Madrid's Gareth Bale - but Northern Ireland cast their net around the lower divisions for the majority of their squad. And yet they have made the finals in France, getting their vital win without their most experienced defender, West Bromwich Albion's Jonny Evans, after he was injured at the weekend and top scorer Kyle Lafferty, who has scored seven goals in qualifiers but was suspended on Thursday. Derby County defender Chris Baird was also missing through suspension - no problem for a squad built on passion, spirit and no little ability. There was a Premier League presence in the starting line-up in the shape of Manchester United youngster Paddy McNair, 35-year-old West Bromwich Albion defender Gareth McAuley and his Baggies' team-mate Chris Brunt. Watford's Craig Cathcart also played his part, with 30-year-old Southampton midfield man Steven Davis the hero of the night with two goals. They are among the bigger names, but the likes of 31-year-old Hamiton Academical keeper Michael McGovern, Reading's Oliver Norwood, Blackburn Rovers' Corry Evans, Stuart Dallas of Leeds United, Nottingham Forest's Jamie Ward and Kilmarnock's Josh Magennis, the other goalscorer, all added their names to the list of heroes. Magennis was not even born the last time Northern Ireland reached a major tournament. Elsewhere, and equally valuable to O'Neill, are squad members such as Fleetwood Town right-back Conor McLaughlin, who was playing a 1-0 defeat at Scunthorpe United last weekend that left them 23rd in League One. He was suspended for the Greece game - but has played his part in the Euro 2016 campaign and can now look forward to a drastic change of sporting scenery in France next summer. It is the way in which O'Neill has moulded this nomadic group together that is a tribute to him and them - and proof that team spirit, shrewd man management and growing confidence can go a long way. When O'Neill presided over those two humiliating defeats to Luxembourg and Azerbaijan in a dismal 2014 World Cup qualifying campaign, even he would have thought the notion of him as a national hero far-fetched. Not any more as he can now be bracketed with the great managers of this small, proud sporting country as it prepares for Euro 2016. How wonderfully he has rewarded the Irish FA for keeping faith despite those humbling losses. The 46-year-old took charge at the end December 2011, shortly after leaving Shamrock Rovers, where he made history as they became the first League Of Ireland side to reach the group stages of a European competition, in the Europa League. The celebratory scenes of Thursday in Belfast looked far distant after a World Cup Campaign that brought only one win 10 qualifiers, but O'Neill's calm, measured approach - allied to superb man management - has turned Northern Ireland's fortunes around. A keen devotee of modern football techniques and sports science, he has forged a close bond with his players, perhaps best exemplified by the manner in which the unpredictable and temperamental Lafferty, prone to indiscipline, has become the symbol of his and Northern Ireland's success. O'Neill had a journeyman's playing career as a forward, starting at Coleraine and moving between England and Scotland with clubs such as Newcastle United, Dundee United, Hibernian and Coventry City. He won 31 Northern Ireland caps, scoring four goals. His managerial road started at Brechin City before reaching its peak on Thursday night. O'Neill may be understated and not a character to shout from the rooftops - but why should he when results speak so eloquently on his behalf? And while much focus has been placed on how he has galvanised a group of players, many of whom are under the radar when it comes to profile, it must not be forgotten that Northern Ireland have played with style as well as spirit in this qualifying campaign. Six wins from nine games, with only one defeat in Romania, leaves them with every chance of topping Group F, three points clear of the Romanians as they go into their last game away to Finland on Sunday. O'Neill has been the catalyst. His achievement will inevitably catch the eye of clubs - but for now this most focused of individuals can concentrate on his greatest challenge with Northern Ireland. 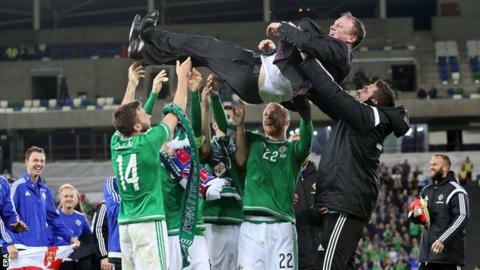 Northern Ireland's real victory is reaching the Euros when few gave them a chance. Now can they make fresh shockwaves at Euro 2016? It must not be forgotten they finished fifth in their 2014 World Cup qualifying campaign, below Azerbaijan and just a point ahead of Luxembourg. This is an illustration of the country's rapid football rise. Reality states that they will travel to France as one of the underdogs - but history also tells us Northern Ireland must never be underestimated. Memories of 15 June 1982 and the night hosts Spain were beaten in Valencia at the World Cup will be revived. Northern Ireland's results prove they cannot be taken lightly and O'Neill's men, plus thousands of fans, will travel with confidence.